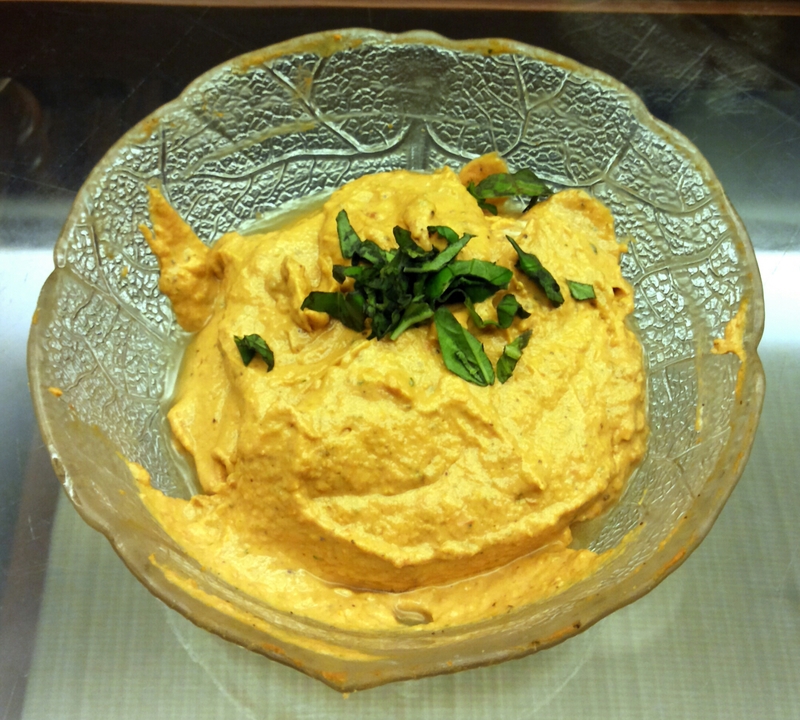 I love writing and blogging and food, good food. . But it’s very difficult impossible, to write or enjoy a wonderful meal with a newborn. S and I welcomed our beautiful, baby girl, ‘A’ into this world in November 2015. Since then things have been on an absolute roll! I am happy to share that my tiny venture – Socially Influenced, a digital communications agency, has taken off well and I have some fabulous clients. I love my job because I get to meet passionate, hardworking and sincere individuals and learn more about other businesses and industries. It is one of the most exciting things and for me – it is as much fun to deliver great content to clients as it is to play & watch Baby Girl A grow! I am blessed that I can follow my passion and get paid for it! Among other news, S and I are slowly and steadily moving into Ahmedabad from our current home in Baroda (or Vadodara). Since the distance is barely 2 hours, we have been dilly-dallying with the actual move and end up going to our Ahmedabad home for just 10 odd days in a month. We hope that with Baby Girl A starting a Parent-Toddler program in AMD, we are more motivated to stay there and enjoy what the city has to offer. From cooking a meal, once in awhile, I now need to cook at least 3 meals a day for us! Making a so-called ‘simple meal’ of Dal, Bhaat (rice), Roti & Shaak (Sabzi), or as we have begun calling it “DBRS”, takes me at least 2 hours! I still don’t know a lot of vegetables and it must be amusing for vegetable vendors when I ask them for help to identify common vegetables like parwal. Moving into your own home is definitely a lot of hard work, planning and organizing especially when you want to have a professional life as well. But, millions of people do it and all it takes is time. I am sure we will get to a smoothly functioning home very soon. It’s a beautiful thing that we have friends and family over who fill our home with laughter. The happiness rings through the house and we love the chatter and sounds of people in our home. We’ve had casual dinners, teas and coffee nights which is perfect! Baby Girl A loves exploring the house and we’ve kept it sparsely furnished so she can drive her trike in the house, or run around, without a care in the world. I’ve found veggie vendors, fruitwalas, small grocers, large grocery stores everything very close to home since we’re located in Prahladnagar. The only thing that has been absolutely horrid is finding an Internet Connection!! We’ve moved in about 5 months ago and we still are struggling to find an internet provider. A huge bummer from me. I hope S can find a way soon to get some connectivity! That’s what my family and I have been upto, what about you? 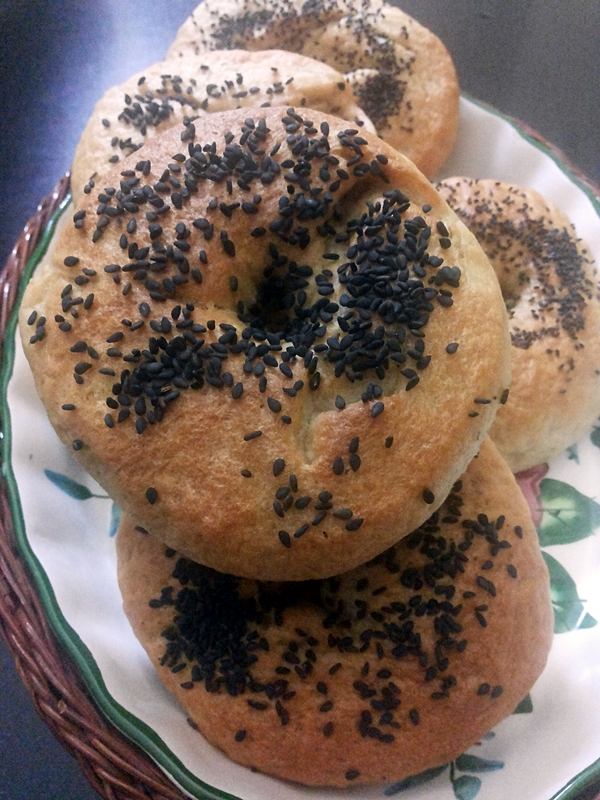 Yummy Breakfast Bagels – New York Style! Last night, S, his family and I were just sitting on the dinner table talking about all sorts of yummy food, after dinner, which made me feel hungry again.. Somehow we got talking about donuts. I loooved donuts! There was this absolutely fabulous donut shop in downtown Monterey, California called Red’s Donuts, that made the most amazing, fresh ones. They were pretty much sold out by 10 AM and shut shop at 1 PM.. Ohhh the days before calories really mattered! We would head straight to the donut store after a short gym workout and I would get the custard filled ones! And the chocolate cakes ones! And the plain chocolate ones! And the cinnamon sugar ones! If you saw me, you could tell I’ve definitely enjoyed a donut or two! 😀 Donuts are definitely my favorite kind of breakfast! S preferred to have bagels with sundried tomato cream cheese, as a rare breakfast treat – just proving how opposite we really are! I thought bagels are the healthier breakfast option, perfect for a daily breakfast. But then again, I am comparing one bagel to 3 donuts..
S’s parents couldn’t help but remember the time they would take their twin granddaughters down the street to get some bagel and cream cheese, one of the twins’ favorite snacks! It seemed like there were many memories attached to bagels and since we don’t get them in Baroda, I decided to look into making some. The first few recipes I researched were all traditional bagel recipes which needed a lot of proving time, a very specific starter yeast etc. Then I found this fabulous recipe which assured me I would have hot bagels on the table in under 2 hours! I cheated and even used instant yeast to get them faster and it worked! These bagels turned out chewy, yeasty and fresh! I even used all whole wheat flour to make them a tad bit healthier. Without any oil or butter, I could feel guilt free about eating these with some cream cheese and of course, butter! Mix the flour, yeast and salt in a large bowl. Make a well in the middle and pour in the yeast and sugar mixture. Pour half of the remaining warm water into the well. Mix and stir in the rest of the water as needed. Depending on where you live, you may need to add anywhere from a couple tablespoons to about ¼ cup of water. You want to result in a moist and firm dough after you have mixed it. On a floured countertop, knead the dough for about 10 minutes until it is smooth and elastic. Try working in as much flour as possible to form a firm and stiff dough. Lightly brush a large bowl with oil and turn the dough to coat. Cover the bowl with a damp dish towel. Let rise in a warm place for 1 hour, until the dough has doubled in size. Punch the dough down, and let it rest for another 10 minutes. Divide the dough into 8 pieces. Shape each piece into a round. Now, take a dough ball, and press it gently against the countertop (or whatever work surface you’re using) moving your hand and the ball in a circular motion pulling the dough into itself while reducing the pressure on top of the dough slightly until a perfect dough ball forms. Repeat with 7 other dough rounds. Coat a finger in flour, and gently press your finger into the center of each dough ball to form a ring. Stretch the ring to about ⅓ the diameter of the bagel and place on a lightly oiled cookie sheet. Repeat the same step with the remaining dough. After shaping the dough rounds and placing them on the cookie sheet, cover with a damp kitchen towel and allow to rest for 10 minutes. Meanwhile, preheat your oven to 425ºF / 220ºC / Gas Mark 7. Bring a large pot of water to a boil. Reduce the heat. Use a slotted spoon or skimmer to lower the bagels into the water. Boil as many as you are comfortable with boiling. 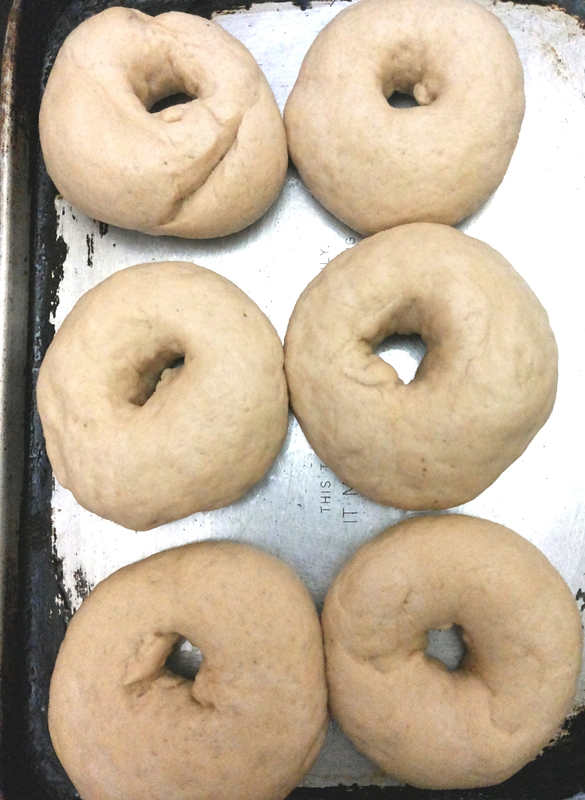 Once the bagels are in, it shouldn’t take too long for them to float to the top (a couple seconds). Let them sit there for 1 minute, and them flip them over to boil for another minute. Extend the boiling times to 2 minutes each, if you’d prefer a chewier bagel (results will give you a more New York Style bagel with this option). If you want to top your bagels with stuff, do so as you take them out of the water, you may use the “optional toppings” (listed above) to top the bagels. Once all the bagels have boiled (and have been topped with your choice of toppings), transfer them to a lightly oiled baking sheet. Bake for 20 minutes, until golden brown. We enjoyed these straight hot from the oven and they were so good! I definitely recommend spreading some delicious cream cheese (either plain or flavored like we did). I do hope S felt like he was back in New York and his parents back in Toronto. I wonder how I can improvise these. 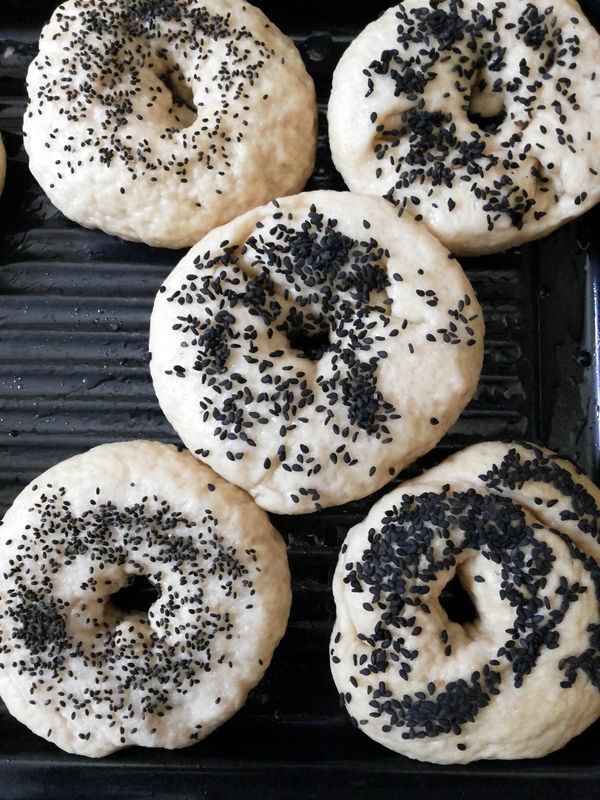 I am quite sure if I use only all purpose flour or if I add some gluten the texture will change, hopefully fluffier and lighter compared to the denseness of these bagels. In either case, we really enjoyed eating these for breakfast the next day as well! You know the saying, “Opposites attract”? I never believed it and could not understand how two people who are completely different could live together. That was all until I met S. If you know one of us, it is so very easy to know the other one without ever meeting them. You just have to remember that if I like something, S won’t and vice versa. Let me try to explain this better with an example. I never enjoyed Asian food. I don’t think I would even go out with my friends if they decided to go for Chinese food. The only time I remember joining them was when I was 16 and had just entered Junior College or High School. A friend’s older sister kept raving about this teeny place in one of the lanes of Koregaon Park called Malaka Spice. The restaurant served South Asian food, which was not such a popular concept a few years ago, that made it a ‘must-try’ place. Koregaon Park was the most happening place to be and we decided to go and try this restaurant out. None of us really knew that much about Vietnamese food or Thai Food of Malay food at that time. We ended up ordering a bunch of things that did not really go well together and hated it! For the longest time I kept thinking that the restaurant served bad food, not once thinking that maybe we did not know what to order. I didn’t go to Malaka Spice for almost 6 years! Then I met S……..
S loves Asian food! He can polish off anything remotely Asian, sometimes even after eating dinner. His mom once told me that she would hide the bottle of soy sauce because he would love to pour it on everything. Back to 2 years ago, S was coming to Pune and I knew that I had to find a good Asian food restaurant otherwise he would think that the only restaurant I knew in Pune was Dario’s! After doing a lot of research online and talking to a bunch of people, I was convinced that the food at Malaka Spice was good and it was just us who couldn’t pair the food correctly. We went to the new Malaka Spice, which had opened in place of a very popular nightclub ‘Lush’, in Lane 3. The atmosphere was wonderful! Lots of red paper lanterns, wrought iron furniture, very green and oh-so-cool. They do have an indoor seating as well but I have always enjoyed outdoor more. We took a table in a quiet spot and I decided to let S order. This time around, the food went together perfectly. I enjoyed all the flavors and I decided to bring it back from the “Never-go-again” list to the “Go-To” list for Asian food. We went back many times again but we went last with my mom when we were in Pune. By now, we each have our favorites. We always start with the Vegetable DimSums, follow it with Pad Thai or any flat noodles, order some curry – either Red Curry or Penang Curry with herbed rice to end a super satisfactory meal. I have never had any space for dessert after eating all the yummy food and honestly, have never missed it. The food tastes fresh, flavorful and is always served on time. The servers are well-trained and know how to pair food with alcohol. The vibe at the restaurant is very relaxed and it makes for a great place to meet with a large group of friends and enjoy a few drinks together. There is plenty of seating and the restaurant gets noisy only if you go for dinners over the weekends. I have had some hiccups here- once the rice was not cooked through and once they served us very foamy draught beers but both times, they made up for their mistakes. They could be more gracious and accepting of their mistakes but they have never been overly rude and have corrected the mistake without much arguing. To sum it all up, this is a great place to try some authentic and very delicious South Asian food in Pune. I keep going back here and when I am in Pune, the first place I have to take my mom is here! For a wonderful ambience combined with good food, I give Malaka Spice a 4 on 5!